Cats only sets up the eye bones. Eye tracking is solely handled by Vrchat ingame by rotating the eye bones and using the blink shape keys. Yeah but creating blink keys doesn't help with eyetracking, does it? So what does this tool do, why do we have to use it for eyetracking to work properly? You don't have to use cats for eye tracking, it just simplifies the process. Whenever I click the "Fix Model" button, this error pops up. 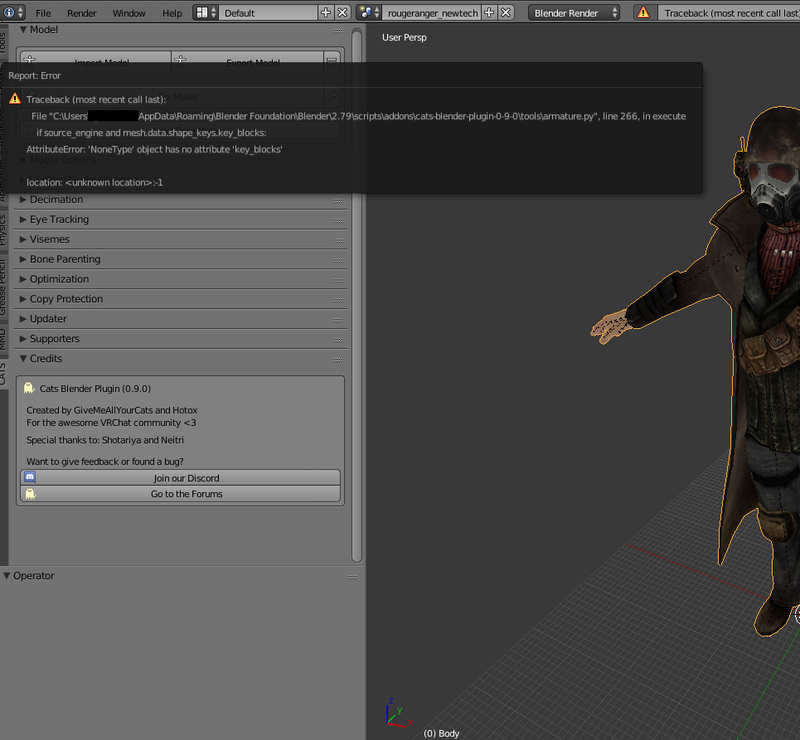 I am still new to blender so i'm not sure what this error means, the reason why I came here for help. Hey, this is fixed in the development version. Update to it with the build-in updater. That might be possible. I will look into that but it will not be done anytime soon. Hello! I have a question about this plugin. Can I use this plugin to also include in custom made games? Is this plugin only useful for VRChat? I would really like to use this plugin to import characters into my homebewed games just for laughs and giggles! Sure, you can do that. But be aware that most downloadable models are not allowed for commercial use. Why the model that i downloaded, dont have the "fix model" button ? Make sure that the model has an armature. If it only has a mesh you need to rig it either manually or with Mixamo. The viseme strength slider appears to be missing from the newest version. Is this a bug or was it removed for some reason? Looks like an issue with that model. Can't help you with that, sorry. It will be back next version! You can use it now by using the dev version of cats. Why? I now have to redo 100's of animations because all the blend shapes will be different names if I use this new version on future models. Because of better translations and higher speed. This was really overdue and improves the quality overall. First I deleted all the keys except the first one and then used Ctrl+C and Ctrl+V to copy and paste the keys. I am not going to go through 100's of animations all with multiple blend shapes and manually copy paste key frames just to gain slightly faster translations of names that no one will even see or care about. Guess I will just be permanently on version 0.9.0. Oh well. I might add an option to translate shapekeys with Google Translator only.